Tire Rebates: Select tire brands and sizes only. See dealer for details. If you're looking to purchase Goodyear automotive tires for sale near you, then why not stop by Ewald Automotive Group Milwaukee and our tire shop near you in the Milwaukee WI ahead. We are one of the leading providers of tires for sale near you in the Milwaukee, WI area and we offer a wide variety of automotive tires to fit your car, truck, or SUV, as well as excellent tire service and repair. There are many things to consider when choosing the right tire for sale near you, such as size, type, tread, and even fuel economy, and the guys here at Ewald Auto Group and our Tire Service Milwaukee center will be happy to help, and have great tire deals to offer you. Today's tires have between 19 and 25 different components, which makes choosing the right tires near you more difficult now than ever. Choosing the wrong tires is something that will haunt you every time you get behind the wheel, so making the tires near you that are right for you is essential. A lot of times it's easy to go for the cheap option because it can save you money in the short run, but looking for cheap tires for sale that are not right for you can end up costing you even more in the long run. But is saving money more important than safety? We think not, a cheap tire can impact things like comfort, handling, overall car performance, and not to mention the fact that you will be replacing them much sooner. Thankfully, at our Tire Repair and Service Center we have great tire deals for you to check out. Trust us when we say that a quality tire is what you need! Quality tires near you such as Goodyear tires in Milwaukee from Ewald’s Auto Service center is guaranteed to last longer. So you won't have to bother with costly replacements any time soon. A common mistake is to select a tire without considering its ability to hold the road. Our quality car tires will grip the Milwaukee road better, providing better car handling on those wet and winding roads. Ewald quality car tires from Milwaukee, WI will also provide a more smooth and comfortable ride for you and your passengers. Depending on the tire you select you could see a 15 to 20 percent difference in fuel economy. With a quality tire from Ewald Automotive Group auto parts and service center you are sure to see an improvement in fuel economy. In the end you can clearly see that buying quality automotive tires such as Goodyear tires in Milwaukee from Ewald's Tire Repair and Service Center is much better than buying cheap car tires. Here at Ewald Automotive Group, quality does not always mean expensive. 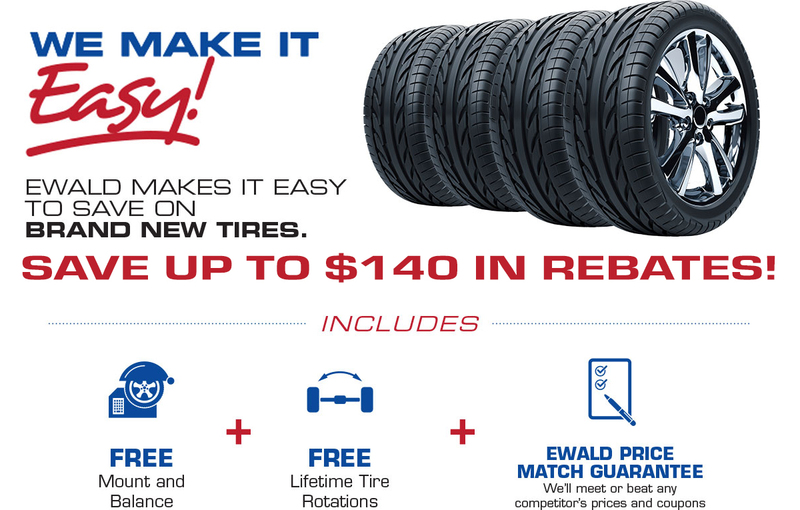 We offer inexpensive quality tire options with a large selection of Goodyear tires, for any car, truck, or SUV you are looking to put new car tires on, so schedule a tire service with Ewald Automotive Group’s Milwaukee Tire Center today!